Split leather comes from cow skin after a precise splitting process.It is moderate genuine leather,soft and anti-scratch.To creat a fashionable look,the leather is often polished and oiled,which makes the surface shinier and sleeker.The more you use,the more retrospective it will be.It may have natural odor at first,but the smell will disappear after a couple days' airing out.Sometimes some customers may mistakenly consider it as vinyl or cheap material,but in fact they are totally different aterials.Cow split leather all comes from a cow skin,100% genuine leather,and is harmless to human body and way too much durable than vinyl while vinyl is all made of chemical material and irritating to human. If you need help or have any question,please contract us.we will reply your doubt. If you are not satisfy with something, please don't leave us negative or neutral feedback right away. Please contact us via email. We promise to provide 100% fine customer service and try best to make every customer get good mood with fine shopping experience here. 1:Due to the monitors difference,the true color might be slightly different from the photos. 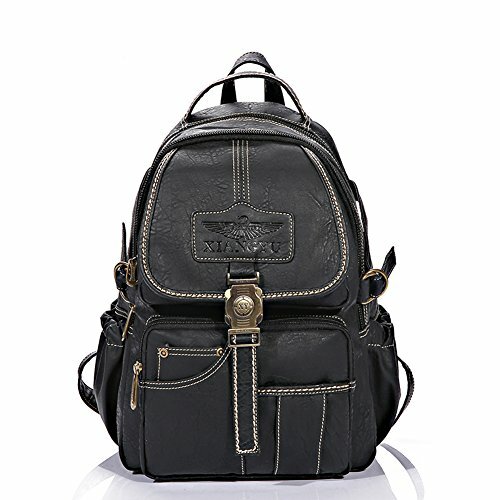 2:Genuine leather material has natural leather smell,but it will be disappear after you use in a few days. ☆Characteristic:Rich internal structure, a large main pocket and multiple sandwich design, a zipper pocket, a cell phone bit. Can accommodate A4 magazine and your ipad. And your headphones, wallets and umbrellas and other personal items. For your work, study, and travel. You can buy it for yourself, or you can give to friends as a gift. If you have any questions about this product by Yaoko, contact us by completing and submitting the form below. If you are looking for a specif part number, please include it with your message.